On this Tiwi Island tour Learn about the Tiwi people and their unique culture – a once in a lifetime opportunity to visit a modern day Aboriginal community. This one day tour will provide you with an insight into the Tiwi people’s rich culture and lifestyle. The tour will reveal scenes seldom seen by many outsiders and leave you with a lifetime memory. Many cities are blessed with island destinations close by, but only Darwin has the Tiwi Islands. 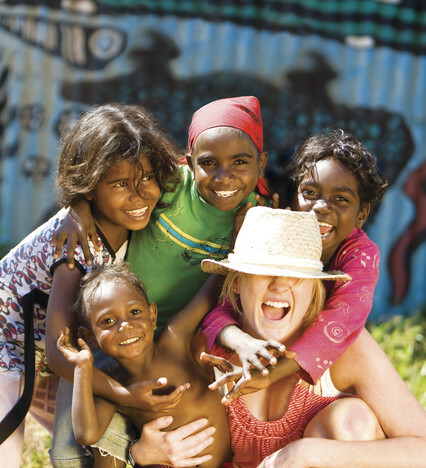 They are home to the Tiwi people, coastal island Aborigines with permanent smiles. Today you’re up early to get started on a day that you’ll long remember. Make your own way to Cullen Bay Ferry Terminal to board your ferry – the “Pacific Cat” and after a 2.5 hour cruise you’ll arrive at Bathurst Island. Upon arrival at the Aboriginal community of Nguiu on Bathurst Island you will meet your Local Guide who will take you on a journey through the progressive, modern day Aboriginal community of Nguiu (Wurrumiyanga). First you will visit the museum with its interesting displays of traditional art and depictions of the Tiwi ‘dreamtime’ stories and Early Mission Precinct with its unique Tiwi style Catholic Church. Your guide will tell you about the colourful history of the early mission days and learn how the Tiwi people have blended their culture with Christianity. Spend time with some Tiwi Ladies while they work on their weaving and painting. Your guides and the ladies will also demonstrate their totem dances and perform a smoking ceremony to bless their visitors and explain the meanings behind them. You will also be taken through the world renowned Tiwi arts and crafts co-operatives and see where the artists work and possibly see some of them at work. You also have the opportunity to purchase Tiwi arts and crafts and screen-printed fabric at Island prices. Stop at a picturesque lookout, which is the setting of a Tiwi burial site where we can learn some of the complex rituals associated with the Pukamani Poles (burial poles), before being taken back to the ferry landing to re-board your vessel, departing Bathurst Island for Darwin at 3.15 pm. Low level of fitness required. Small amount of walking.